On a recent trip to South Queensferry we went on a ferry trip to the Island of Inchcolm on the Firth of Forth. This only takes 30 minutes and a ferry service is operated by two companies - 'Maid of the Forth' and 'Forth Tours'. 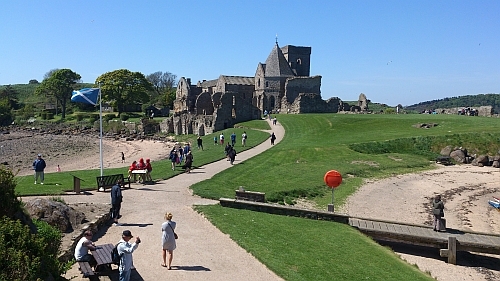 This Island of Inchcolm is managed by Historic Scotland and an admission fee is charged. Historic Scotland and English Heritage members will have the this fee deducted from the ferry fare on production of their membership cards. On the day we visited it was very warm and sunny in South Queensferry, but once on the ferry it turned much cooler. We sat on the deck, rather than in the heated interior, as we wanted to take some photographs. 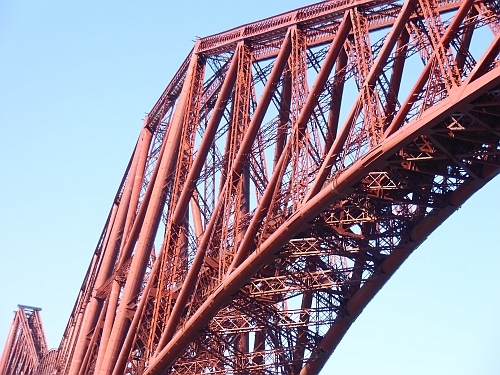 The ferry journey took us under the Forth Railway Bridge and it was good to get a close-up view of it from the river. It was quite a spectacular sight. On the North Queensferry side of the bridge we saw a small island which resembled a warship due to the number of small buildings on it. This is the island of Inchmickery, which is now an RSPB reserve. Inchmickery is only 100 metres by 200 metres in size. 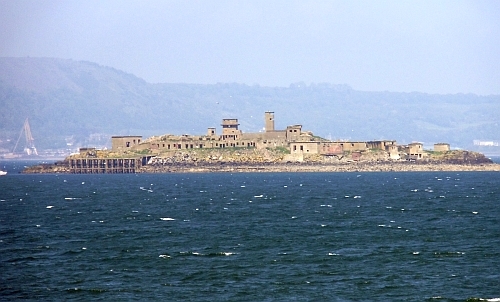 The buildings in the island are from the World Wars when the Firth of Forth was deemed to be an area prone to attack by the German Navy, due to the proximity of the Royal Naval Base in Rosyth. The buildings housed the guns to defend the Forth in the event of an attack, which fortunately never occured. In recent years the buildings have been used in the film industry and the island was used recently in the making of the film 'Complicity'. The exposed rocks off Inchmickery are known as the 'Cow and Calves'. As we travelled along the Forth on the ferry, we got excellent views of both sides of the river. 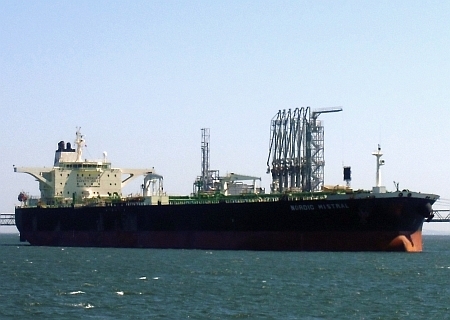 We passed a platform where oil tankers could unload crude oil from the Forties pipeline to a storage tank area. As we passed, a tanker was unloading its cargo. 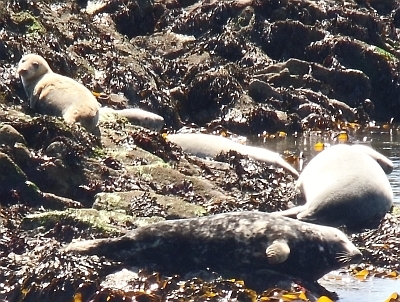 We then passed a small rocky area and were fortunate to see some seals lying on the rocks soaking up the sun. The looked over at us as we passed by at a respectable distance so as not to disturb them. Some other islands had Cormorants, Gulls and other seabirds nesting on them. The Island of Inchcolm was coming closer and very soon we had landed on it. Inchcolm takes its name from St Colm. 'Inch' is the Gaelic name for island. 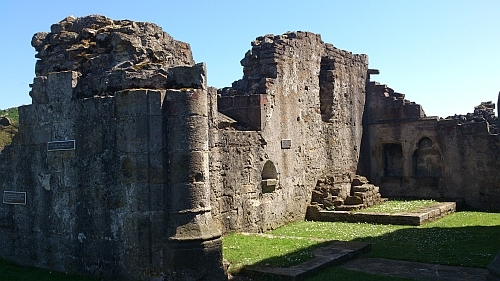 A monastry was established on the island in the 1100's and was elevated to an abbey in 1235. Parts of the building are very well preserved with the cloister being the best preserved of all the medieval ones in Scotland. After the Scottish Reformation in 1560 it ceased to be an abbey. 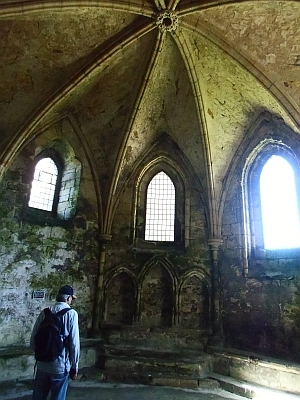 David I established a priory here in 1235 which are the best-preserved group of monastic buildings in Scotland. 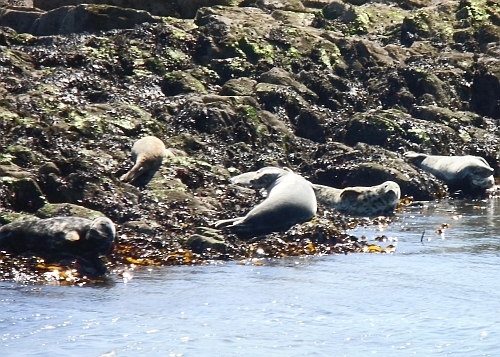 The island is also a great area for wildlife including seals and coastal defences from the two World Wars. The chapter house is also an impressive octagonal building and is the only surviving cloister building from the 12th century. The chapter house was the meeting place which was used to conduct the business of the community. 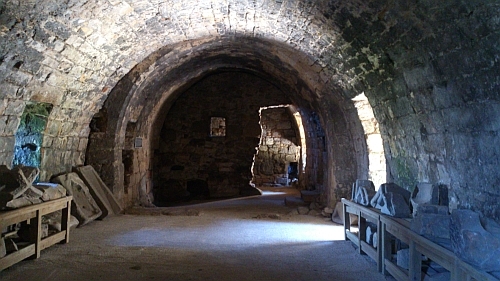 The seats under the arches were for the Abbot, Prior and Sub-prior. The rest of the monks sat on the benches around the walls. The cloister is rectangular rectangular in shape with a gable at the top. It would have been used to house the domestic buildings of the abbey. It has two levels and contains a kitchen, refrectory, dormatory, latrine and washing facilities. Most of the buildings in the cloister were built around the 1400's. It is the most complete cloister in Scotland and is particularly unusual due to the covered walkways on three of its sides. There are the remains of two churches. Parts of the 12th century church are still standing, including the nave and bell tower. In the 1400's it was no longer used as a church and became a residential area instead. Little remains of the the 15th century church, although the outline of it can still be seen, which shows that it was in the shape of a Christian Cross. 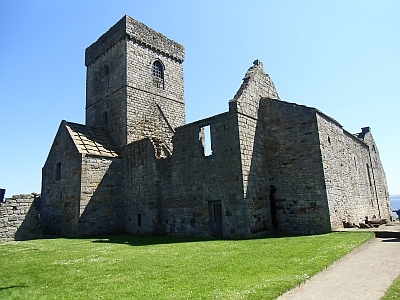 It was built after the Scottish Wars of Independence, which were fought in the late 13th and early 14th centuries between Scotland and England. Remarkably well preserved, the bell-tower was built around 1200 and is one of the outstanding features of the Abbey. While travelling to the island by ferry, the bell tower was the first part of the abbey to come into view. 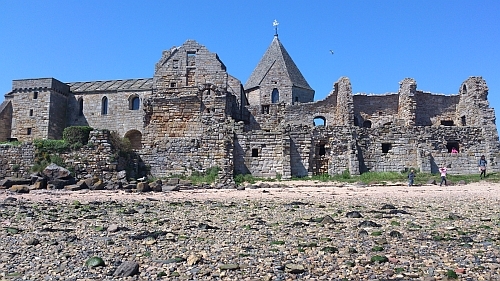 The abbot's house is situated on the south side of Inchcolm Abbey, and is connected top the end of the east cloister. As the above photograph shows, it is a ruin. 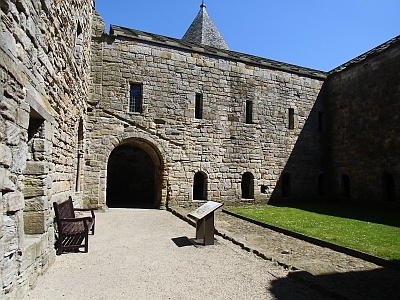 The inside of the Abbot's House is barrel-shaped and there are the remains of a bakehouse on the north-east side. Our visit was in late May and the Gulls were nesting on the island. Despite the many signs requesting visitors to avoid the parts of the island where the birds were nesting, many of them insisted on walking to the nesting areas. This caused the birds to act in an aggressive manner as nesting birds will always act aggressively to protect their nests. There are buildings remaining from the World Wars which were used to defend the Forth from attack. The Forth estuary was the most heavily defended in Britain to prevent attack from German warships. The buildings were situated in the nesting areas so we respected the birds privacy and stayed well away from them. The island has also been used in previous conflicts including the Napoleonic Wars and in the 1790's a hospital was established on the island to provide medical support for the Russian fleet which was stationed in the Forth. This small island certainly has had a chequered history! The time allowed on the Island before the ferry returned to Queensferry was 1.5 hours. This was not nearly enough time to explore the Island fully. We intend to return in June or July when we will have a great chance of seeing Puffins. One thing to remember is to bring plenty of drinking water as there is no running water on the Island. The small Historic Scotland shop does sell bottles of juice and some snacks as well as non edible goods such as china mugs, tea-towels, books, Scottish shortbread and small ornaments. The visit to the Island is worthwhile and very enjoyable.